Water usage of a garden hose depends on the hose diameter, the length or number of hoses you have running off a single faucet, and whether the hose is running on a level surface. Water usage also depends on any attachments you are using at the end of the hose, as these can lower your water usage. Garden hoses come in three sizes, measured in the hose diameters of 1/2 inch, 5/8 inch or 3/4 inch. If there are no attachments at the hose ends, the smaller diameter hose will use 9 gallons of water per minute, the medium-sized hose will use 17 gallons per minute and the larger hose will use 23 gallons per minute. The amount of water a hose uses also depends on the resistance, or pressure loss on the hose. A hose traveling uphill will have a greater pressure loss than one traveling across level ground, because both gravity and friction will be working against the movement of water, meaning water will move more slowly than it would on level ground. The best way to counteract this is to use the hose with the largest interior diameter, which will minimize the pressure loss of the friction of water against the hose interior, leaving only the pressure loss due to gravity. 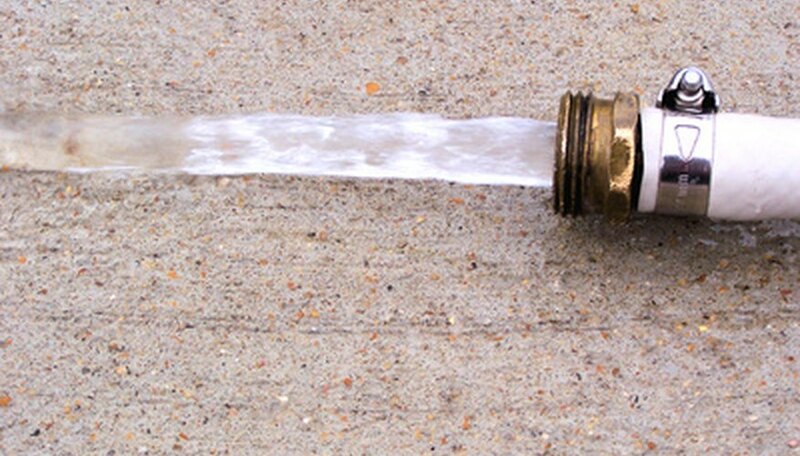 The easiest way conserve water with your garden hose is to attach an adjustable nozzle. This way, you control water output depending on what you are watering. There are spray nozzles which attach directly to the end of the hose, as well as longer (non-adjustable) wand nozzles which give your hose extra reach. Hoses with drip irrigation lines attached to them will use far less water than hoses without any limiting attachment. Drip lines are perforated for constant irrigation, and because of this, can only be placed where water is needed. A garden hose should be run to the plant bed, where the drip lines can be attached to the end of the hose and placed around the plants that will need irrigation. Drip line water usage is measured in gallons per hour, and not gallons per minute, as plain garden hoses are. Drip line water usage usually ranges between 1 and 4 gallons per hour, depending on the water pressure and the line size. Water usage depends on the available water pressure from your faucet. Normal water pressure is 40 psi, but if you have higher water pressure, the amount of water coming out of your hose will be greater. You can always measure your exact usage in gallons per -minute by timing how long it takes to fill up a 5-gallon bucket and dividing 5 gallons by the measured time. You can further conserve water by attaching your hose to a rainwater collection barrel, and using rainwater to water your garden instead of your faucet. Cyclist and organic gardener Delia Rollow has been writing since 2010. She has been published in the "Commonwealth LitMag." Rollow has a Bachelor of Science in environmental studies from Bard College.